As facilitators, our main moves are to enter the conversation (started either through our prompts or by the teacher), to listen with interest, to draw out more from the teacher through questions and comments, and to show enthusiasm for anything that sounds like it might be worth writing more about. 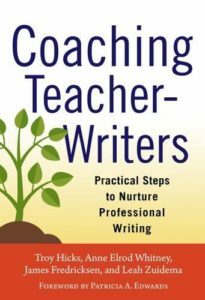 At the moment where it seems the teacher is starting to get animated, we interrupt and ask him or her to stop talking: That’s the time to start writing. Together. Whether we are talking with one teacher at a desk, meeting a small group at a coffee shop, or leading a larger group in a workshop or class, we start together. We’ve found that this model, which Nancie Atwell (1987) used with her young students, is also one that works for adults: When it’s time to write, we pull out our pens or laptops and spend time side by side, all of us writing.